Mary "Missy" Cummings received her B.S. in Mathematics from the US Naval Academy in 1988, her M.S. 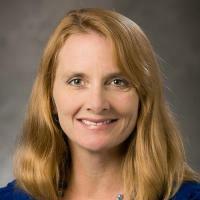 in Space Systems Engineering from the Naval Postgraduate School in 1994, and her Ph.D. in Systems Engineering from the University of Virginia in 2004. A naval officer and military pilot from 1988-1999, she was one of the Navy's first female fighter pilots. Cummings is currently a Professor in the Duke University Pratt School of Engineering, the Duke Institute of Brain Sciences, and is the director of the Humans and Autonomy Laboratory and Duke Robotics. Her research interests include human-unmanned vehicle interaction, human-autonomous system collaboration, human-systems engineering, public policy implications of unmanned vehicles, and the ethical and social impact of technology. Human-unmanned vehicle interaction, human-autonomous system collaboration, human-systems engineering, public policy implications of unmanned vehicles, and the ethical and social impact of technology. Cummings, ML; Quimby, PW, The power of collective intelligence in a signal detection task, Theoretical Issues in Ergonomics Science, vol 19 no. 3 (2018), pp. 375-388 [10.1080/1463922x.2017.1381776] [abs]. Cummings, MM, Informing Autonomous System Design Through the Lens of Skill-, Rule-, and Knowledge-Based Behaviors, Journal of Cognitive Engineering and Decision Making, vol 12 no. 1 (2018), pp. 58-61 [10.1177/1555343417736461] [abs]. Nneji, VC; Cummings, ML; Stimpson, A; Goodrich, KH, Functional requirements for remotely managing fleets of on-demand passenger aircraft, Aiaa Aerospace Sciences Meeting, 2018 no. 210059 (2018) [10.2514/6.2018-2007] [abs]. Zhu, H; Elfar, M; Pajic, M; Wang, Z; Cummings, ML, Human augmentation of UAV cyber-attack detection, Lecture Notes in Computer Science (Including Subseries Lecture Notes in Artificial Intelligence and Lecture Notes in Bioinformatics), vol 10916 LNAI (2018), pp. 154-167 [10.1007/978-3-319-91467-1_13] [abs]. Elfar, M; Zhu, H; Raghunathan, A; Tay, YY; Wubbenhorst, J; Cummings, ML; Pajic, M, WiP abstract: Platform for security-aware design of human-on-the-loop cyber-physical systems, Proceedings 2017 Acm/Ieee 8th International Conference on Cyber Physical Systems, Iccps 2017 (Part of Cps Week) (2017) [10.1145/3055004.3064846] [abs].